Democrat Julián Castro talks about exploring the possibility of running for president in 2020, at his home in San Antonio in December 2018. Announcing his presidential bid in his hometown of San Antonio, Texas, Castro said, "This is a community built by immigrants. Families from Mexico but also families from Germany and other countries ... Today, this community represents America's future." "Going forward," Castro said, America "must be the smartest, the fairest, the healthiest and the most prosperous nation on earth." The 44-year-old is the first Hispanic candidate to enter the race for the White House, joining Massachusetts Sen. Elizabeth Warren and Hawaii Rep. Tulsi Gabbard. Several more well-known candidates are expected to announce their plans soon. Castro launched an exploratory committee last month called "Julián for the Future" and has already traveled to early primary states, with more visits to Iowa and New Hampshire scheduled for next week. "Americans are ready to climb out of this darkness. We're ready to keep our promises, and we're not going to wait. We're going to work," Castro said in a video last month announcing he was testing the waters. Castro has pointed to his experience on both the local and federal level. He was the youngest-ever city councilman in San Antonio's history when he was elected in 2001 at age 26. Eight years later, he was elected mayor. In 2012, he gave the keynote address at the Democratic National Convention — a step that had catapulted Barack Obama to national fame eight years earlier — telling the crowd about his experience as part of an immigrant family. "In the end, the American dream is not a sprint, or even a marathon, but a relay," Castro said. "Our families don't always cross the finish line in the span of one generation. But each generation passes on to the next the fruits of their labor." In 2014, President Barack Obama chose Castro to run HUD. Two years later, Hillary Clinton also considered him as a possible vice presidential running mate. 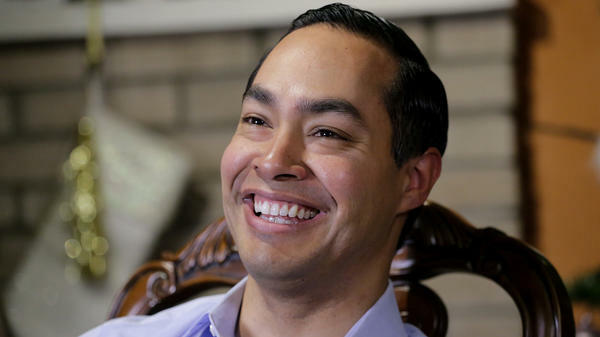 His identical twin brother, Rep. Joaquin Castro, has represented their native San Antonio in Congress since 2013. The two were born into a politically active family. Their mother was an organizer with La Raza Unida in the 1970s, campaigning for the rights of and improved working conditions for Mexican-Americans. Castro, however, may not be the only Texan in the race. Former Rep. Beto O'Rourke, who narrowly lost a Senate bid last year, is also weighing a run and has been on the rise in very early polls. The former HUD secretary, who campaigned for O'Rourke in 2018, told The Associated Press last month that he wasn't worried if he is not testing very high right now in surveys. "If I decide to run, it would be because I believe I have a compelling message and I'm going to work hard and get to the voters and I believe I can be successful," Castro told the AP.